Clip and Save! 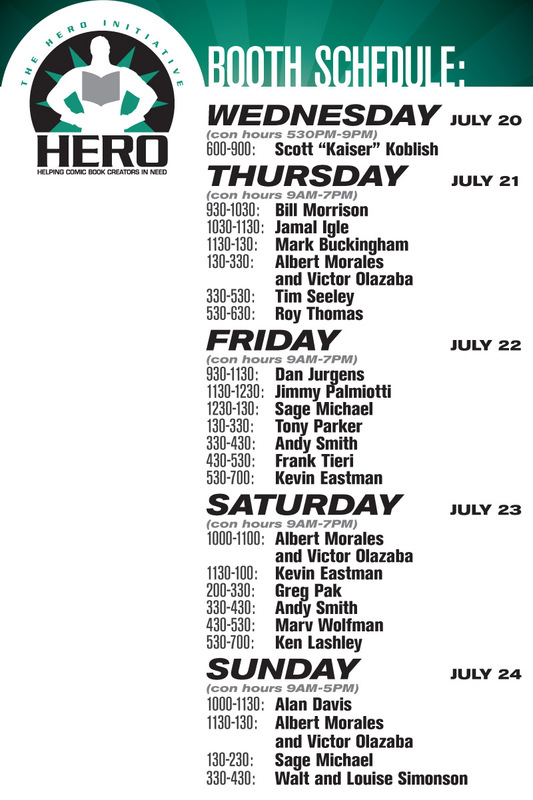 Hero's San Diego 2011 booth schedule! And thar she blows. In easy, carry-around format! We're booth #5003. See you there. 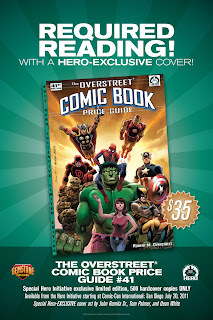 Overstreet #41 land rush is ON! 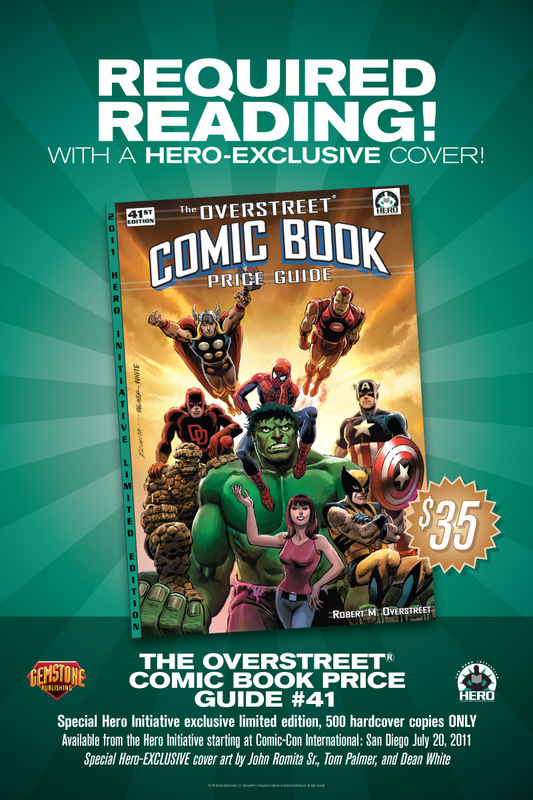 San Diego looms large and looming within it…this year's Hero Initiative-exclusive Overstreet Comic Book Price Guide #41! 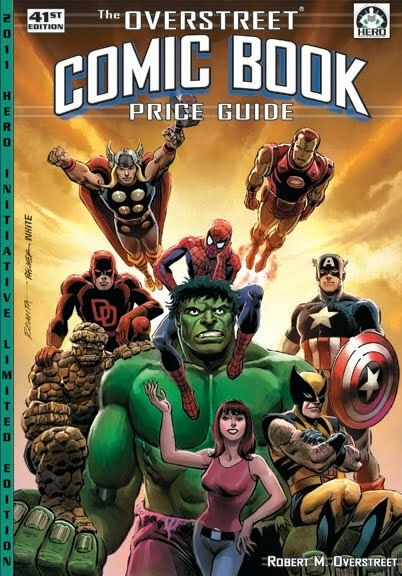 As is befitting a tome of this stature, this year's guide features GREAT Hero-exclusive art by the all-star team of John Romita, Tom Palmer and Dean White. 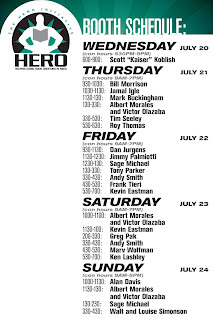 Only 500 hardcover copies have been made, and you get first crack at ’em at Hero's booth, #5003, at the San Diego con, July 20-24! They're $35 a pop, and worth every penny! Get there FAST, as last year, copies moved fast! And for those you NOT trekking to San Diego, you can order your copy through Hero's retail partner, Graham Crackers Comics. Be advised, tho': You can (and should!) order now to make sure you don't get shut out, but orders won't be shipped until the worldwide release date of July 20. The only question? Can you stand the wait? The inimitable George Pérez will be appearing at Acme Comics in Longwood, FL on Saturday, July 2 from 11 AM ’til 2 PM signing autographs and doing quick sketches for benefit of the Hero Initiative. Swing by and say "hi!" For directions, more info and blueberry muffins*, check out Acme's Website. * NOTE: Blueberry muffins not included.